Do you work in the field of hydraulics and need to renew your work equipment? 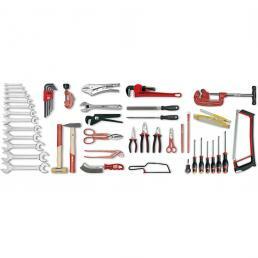 On Mister Worker™ you can find a selection of assortments of plumber tools, available for immediate delivery at a special price and prepared by our experts selecting only professional tools. In the plumbing assortments available on Mr. Worker™ there are only the best professional tools in our catalog, carefully selected to give you the chance to have a complete set of tools. Half-round nose pliers, adjustable pliers, universal pliers, nippers, sheet metal shears, scissors for plumbers, wrenches, pipe cutters, pipe wrenches, screwdrivers, chisels, hammers and wads, files, carpenter's pencils... are just a few examples of what you will find in the plumber assortments available in our online store of professional work equipment. 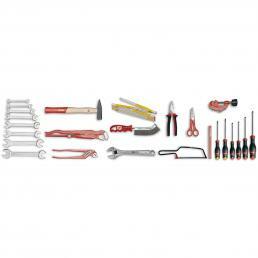 If you want to buy tools for plumbers online, on Mister Worker™ you will find what you are looking for! We give you the opportunity to try professional tools of the best brands at a special price, with the convenience of fast delivery by express courier. If you have doubts or need advice on what to buy, call us on +39 02 9143 3257: our experts will answer from Monday to Friday, from 9am to 1pm and from 2pm to 6pm, and will advise you on the best solution for you.